'The Rocks', the Eben Dyer Jordan II estate designed by Wheelwright & Haven c. 1903 in Manchester, Massachusetts. 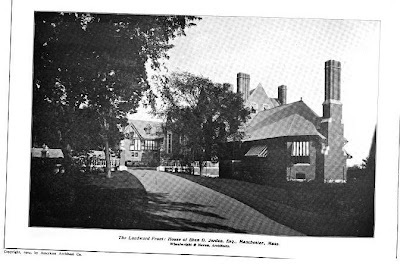 Jordan was head of the firm of Jordan, Marsh & Co., a dry-goods department store co-founded by his father Eben Dyer Jordan Sr. Click HERE to see the Jordan residence on google earth and HERE on bing. Photos from American Architect & Architecture, 1904. Thanks...dunno how I missed it. Youre welcome. Even the stable and cottage appear to be intact just across the street. Great House and setting. It looks like there has been quite a bit of editing, though. In addition to the westward room the entire 2 story wing to the to the east of the front courtyard has been removed and replaced with a 1 story garage. It remains so large and stately that it is hard to feel disappointment that it has been so significantly altered. Great extant stable too. The Jordan estate was called "The Rocks". 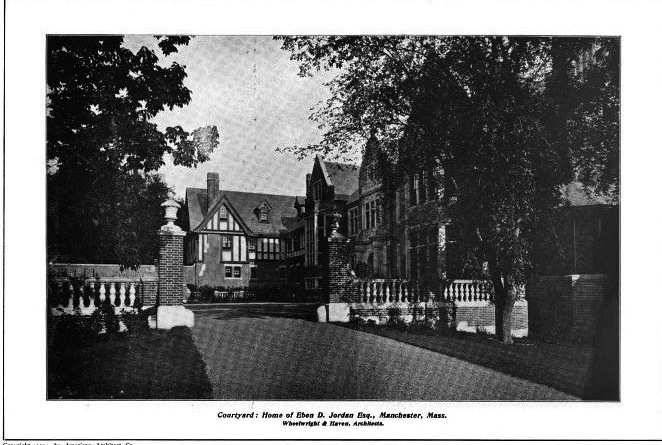 In the 1930s the music room, at the western end, was removed, along with part of the service wing. 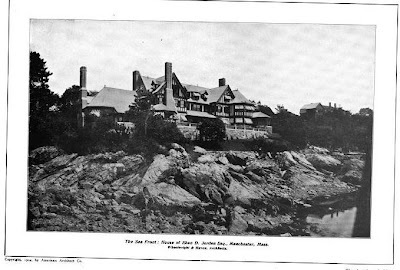 About fifteen years ago the house was acquired by a couple who restored the interiors to their original appearance, rebuilt the chimneys that were cut down in height, and replaced the ocean-side half-timbering that had been removed and stuccoed over. A spacious porch was added at the western end where the music room was located. A wonderful example of preservation by intelligent present-day parvenues ! Do the new owners also own the stable and other out-buildings across the street? Anon' . . . according to our research, the original half-timbered stables, and caretaker's cottage, remain largely unaltered and are still on the original three-and-a-half-acre property. A breakfast cereal comparable to Filboid Studge ! Thanks Old Grey Dog...maybe I looked at Bing wrong because they looked to be across the road. Glad the whole property is still together. They are across the road, not uncommon. many of the stables around Manchester are lined up along the railroad tracks, providing a buffer for the estates along the shore. Any idea what that is between the Stable and the Gardener's Cottage? Some druidic device to ward off further encroachment by the MBTA? Or maybe just a vegetable garden in winter? Magnificent, and sensitively restored/updated without losing its initial impact. Zach, somewhat off-topic, have you got any info on 907 Fifth Ave.? Given that three of Huguette Clark's apartments in this historic building (architect J. E. R. Carpenter won a lawsuit against a 75 ft. height restriction on the Avenue to build it), I'm interested not only in it, but in seeing the 1893 Burden mansion it replaced. The caretaker's cottage and the stable are unaltered and intact. That's a cutting garden between the two. When we purchased the home in '90 there had only been two owners - the original Jordan family, and the Morss family. 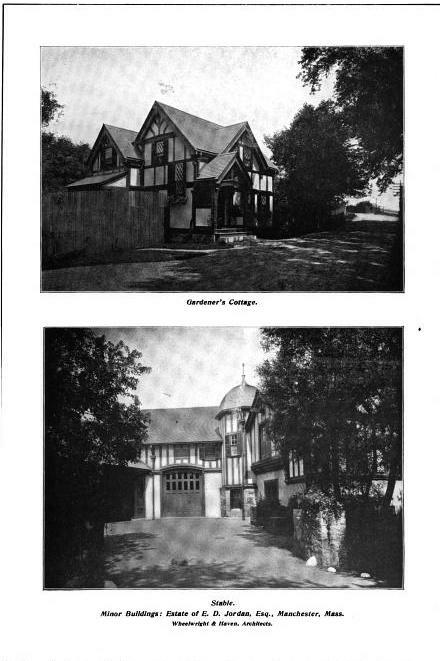 Unfortunately, the main home was in close to tear-down condition, with the roof and several wings having been removed. In a closet we happened to find 130+ linen construction drawings, and so we decided to try to do a renovation that tried to restore some parts of it to the letter (the formal parts of the home), and others at least tastefully to the spirit e.g. the kitchen & master suite. And we didn't bother to recreate the 16 servants' bedrooms when restoring the 3rd floor. We were very fortunate to have had support of the town during restoration: to restore the roof required a height variance granted through the creation of a "historical hardship" with the zoning board of appeals. And to pass Title 5 septic for such a large home (that formerly drained to the ocean) required incredibly creative system design. Thanks for sharing. It's quite nice to hear a story with a good ending for a change!